32 The Hythe01621 859435work Bed & BreakfastA warm welcome awaits you at this comfortable quayside home. 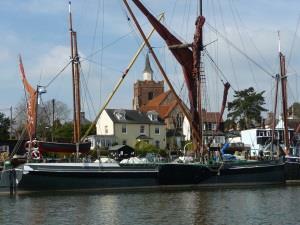 32 The Hythe is a brilliant base for sightseeing, visiting or just relaxing. Relax and enjoy this quite and peaceful haven in a tranquil setting wonderful coastal walks, birdwatching and possibly a boat trip up the river depending on tide and time! On warm summer mornings enjoy breakfast on the decking and watch the world go by. A warm welcome awaits you at this comfortable quayside home. 32 The Hythe is a brilliant base for sightseeing, visiting or just relaxing. The market town of Maldon is famous for our fine natural sea salt, local Wilkins jam factory and Thames Barges all which we are please to accommodate. The lovingly furnished house with all the finest of furnishings and wonderful views of the river not to mention the generous breakfast that awaits you in the morning. Great for exploring the area or just to relax and enjoy what is on your doorstep. Our nearest train station is either Chelmsford or Witham where taxi and buses are available. These train stations are on the mainline to London Liverpool Street.